Many have said. Col! You should write a book! I did it “MY WAY”! It starts as did my life the day I was born, early am. 4th January 1933. Covering my very long, always eventful life, from growing up, then a Toolmaker, Marine Engineer, Musician, Comedian, Compere of Radio and Musical shows. Producer, Director, Costume Designer & Supplier for my own production shows that appeared on both Stage & Cruise ships, it covers my numerous world travels to so many exotic countries and many of my sports coaching adventures and my life as coach of Elite Champion Speed-Skaters, Swimmers, Cyclists. Runners & Triathletes. 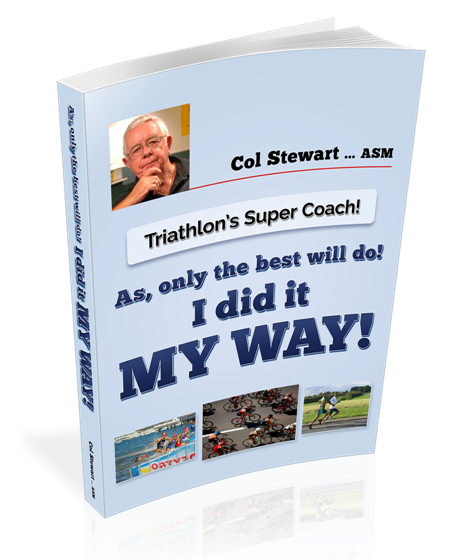 I then added many of my many favorite motivational quotes and slogans, some great stories about training, racing, triathlon trivia. Some training & racing, hints, sports meditation & motivation, designing my unique sports specific, exercises, balance, breathing, stretching, and a whole lot more. Certainly I would suggest my books is well worth reading. To buy your copy firstly you should log into my website. Make your payment by using the “Buy Now Button”! This will allow you to download your. ‘E’ Book. unique sport coach’s mind & life. ‘ so many different sports’. Now, you can read what made him. Highly respected by his peers and athlete’s alike. We strongly recommend this book to all. As it is a very informative story for ‘all ‘ to read! BEING AN ENVIRONMENTALIST! A SAVE OUR TREES ”ECO” ORIENTATED TYPE! MY BOOK IS BEING SOLD AS AN “E” BOOK!